The coast of Greenland, where temperatures in the air and the surrounding waters have been rising significantly over recent years. Photo credit: shutterstock.com. Greenland is typically associated with ice and snow, not smoke and fire. Over the last week, however, the largest wildfire on record has been raging near the town of Sisimiut in the western area of this country. 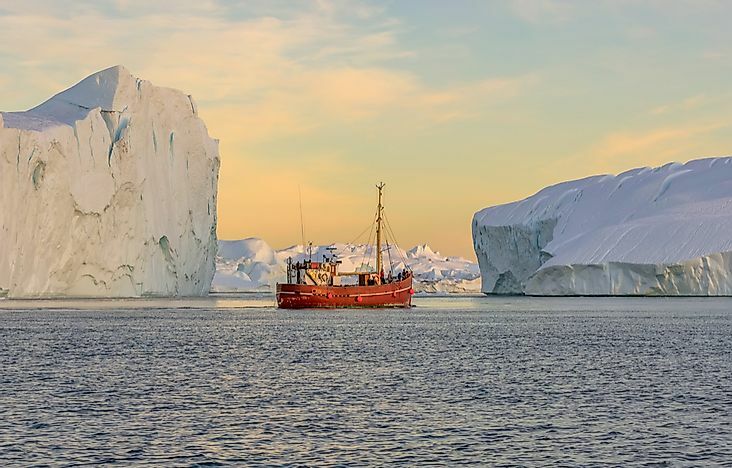 According to a NASA report published in August of 2017, temperatures in the air and the waters surrounding Greenland have been rising significantly over recent years. This increase in temperature has melted the permafrost and dried out some of the area’s plant life, creating the perfect combination for wildfires. In fact, satellite images for 2017 have already recorded an above average number of fires in Greenland. Scientists claim that the current wildfire, first detected by NASA satellite, is the largest to ever be recorded in Greenland over the last 17 years. Melting permafrost is thought to be one of the biggest contributors to this record-breaking fire; most experts believe that it is burning through peat at ground level. This observation is supported by the color of the smoke and the fact that the fire line is not rapidly progressing. Peat fires are particularly dangerous because the large amount of carbon dioxide stored here is released into the atmosphere when burned. In one interview, local residents say these ground fires have been occurring more frequently over the last few decades. Officials in the area are working together to combat the fire, although the region may not have sufficient resources to do so. The smoke is so thick here that police have cautioned outdoors enthusiasts and tourists to stay away from the area. Additionally, hunting has been next to impossible for locals, who rely on reindeer as a major food source. As the fire spreads, it is destroying reindeer grazing areas, which will have a lasting impact on the local community. Scientists are currently reluctant to claim that climate change is the reason behind this wildfire. Its close proximity to the Greenland ice sheet, however, makes this an unlikely spot for a wildfire unless climate change is involved. Researchers say that more information must be collected before a full report can be made. Rain is expected to help quell the flames over the next few days. Amber Pariona is a writer and frequent World Atlas contributor.